Cirepil Wax orders over $500.00 will receive free Cirepil wax to offset shipping charges on UPS ground. Cirepil Wax is known the world over as one of the most popular and effective lines of depilatory waxing product lines. Cirepil's low temperature waxes are applied at or just above skin temperatures (often 20-30 degrees below most waxes on the market). They are manufactured in France by Perron Rigot, the company that holds the patents on formulas for low-temperature waxes and, he is the inventor of no-strip disposable wax. The Cirepil brand is the result of 30 years of innovation and more than 20 patents. As a recognized expert in depilatory waxing, Cirepil is strongly committed to professional training. They have developed certificate training courses, video educational programs, and additional support materials to make Cirepil work well for you in your Spa, Salon or School. NEW!! Cirepil Greenepil is a luxurious hard wax (no strip required) made of 90% plant based ingredients. The remaining 10% are elastomers, essential to ensure the quality encapsulating the hair from the root offering the highest quality of hair removal results. Thanks to its supple and soft texture this wax is very pleasant to work with. Applied in a thin layer, Cirepil Greenepil is cost effective and very successful on removing thick short and shaved hair. Especially suitable for sensitive areas of the skin (underarms, bikini, face...) leaving skin soft, silky and perfectly moisturized. Main Ingredients: Sunflower oil, Shea Butter and Candelilla Wax. NEW!! Cirepil's Vegetale (strips required)is low temperature wax formula that is to be used with strips that will give an excellent depilatory result on all types of hair and skin, especially dry skin. It is a fragrance free wax that is made with chlorophyll and 100% natural ingredients based exclusively on plant extracts. Cirepil Vegetale has a green flluid honey-like texture that is applied very thin, making it more economical when waxing the larger areas of the skin such as the legs, back, and arms. It is easy to use, has a moisturizing effect and softening properties that calm the skin making the hair removal service a more comfortable experience. It is available in a 400 gram tin that reflects the color of the wax. Cristalline is Cirepil's newest no-strip wax formula is ideal for any client with a hyper-sensitive skin. Created without traditional rosin, its hypo-allergenic formula is derived from the precious mineral micro-crystalline. Cristalline has a transparent tangerine color with a very low melting point. Cristalline's creamy consistency is applied economically in a rather thin even layer. We have found it very effective for the bikini area. No picking, removal is gentle and clean. It is not brittle or stringy. say farewell to ordinary strip wax. Hypoallergenic, (fragrance free and mineral based with Microcrystalline vs. Beeswax) proven suitable for all skin types, especially sensitive skin. Cristal goes on so thin , gets closer to the skin, resulting in a more cost effective application. Cristal Ocean leaves the skin smooth, not sticky providing uncompromising hair removal results for all hair types and lengths. Speed waxing just got faster. 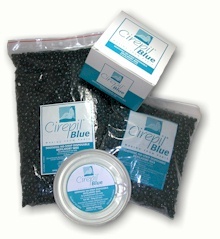 Cirepil Blue revolutionizes waxing with a special polymer that "shrink wraps" the hair for ease of removal, particularly on difficult hair growths. Similar to Cirepil Ease in use for larger areas of the body through smooth application and low temperature, but applied without strips, Cirepil Blue enhances the speed and cost effective value of wax procedures. It's also a totally disposable, low temperature wax designed with soothing Jojoba Oil for the comfort and pleasure of the client. With practice, this wax will compliment Cirepil Ease and fill all your waxing needs year round...whether in winter or in summer. Just as the name suggests, this 100% natural wax conforms to the popular strip method of waxing, but with less wax. Applied as thinly as possible and removed with a special non-woven strip, this wax is ideal for waxing large areas of the body such as legs, backs, etc., but may also be used on the face and other areas, if desired. This non-sticky wax is completely disposable, doesn't string, is easy to clean up with hot water or appropriate wax pot cleaners and is very economical. is the latest discovery by the Perigot laboratories belongs to the new generation of depilatory waxes. This is a disposable wax without strips, which is protected by an international patent. 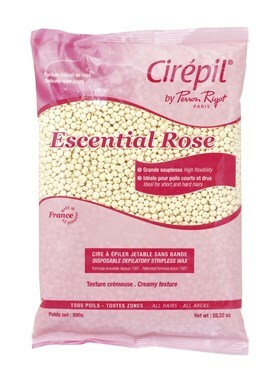 Escential Rose combines the creamy, smooth, and easy to use qualities of the Cirepil Pink wax while taking advantage of the technical progress of the disposable wax without strips. When applied in thin layers, the hair is trapped almost instantly the polymerization. The strip solidifies, but remains supple and does not break. Due to its exceptional hair-removing quality, this wax can be used satisfactorily on all parts of the body. It is available in 400 gram tins and in pastille refills. Escential Rose wax is a low temperature wax to be applied on the skin at 98.6ºF. The original French hard wax, Cirepil Pink is ideally targeted for more sensitive, but difficult, areas of the body such as underarms and bikini. This wax is heated and used at about skin temperature. It's applied in a thick layer with clean edges and when it tries to a non-tacky texture (20-30 seconds), it is removed by itself. This wax is ideally suited for the more sensitive client due to the low temperature and special anti-irritant contained in the wax. Due to the thickness used, this wax is not normally recommended for arms, legs, and other large areas of the body. Perfumed with hibiscus, Nacrée Blanche is a new formula that enables depilatory wax to be used at a very, very low temperature. It leaves the skin very smooth and not sticky. The hibiscus brings tonifying and smoothing properties to the wax. When applied it glides on the skin and is very easy to remove with non-woven strips. NEW!! Cirepil Natural Moisturizing Oil is the result of the combination of several vegetable oils: sunflower (emollient), sweet almond (moisturizing), shea (nutritive), and musk rose (restorative). The combined effect of these oils leaves the skin soft and slightly satiny. It moisturizes the outer layers of the epidermis over the middle and long term (clinically tested). Perfect as a massage to complete the waxing treatment, it leaves the skin with highly moisturized satin finish. is a wonderful light Jasmine based oil, Cirepil Pre-Depilatory Oil is used sparingly on very dry areas of the skin or cold skin prior to waxing. This oil facilitates the effectivness of the wax and conditions the skin at the same time. It may also be used after waxing procedures as desired. Caution is recommended when using to apply only a small amount as over application will cause the wax not to adhere to the hair. This oil is also popular in massage due to light texture and smooth finishing texture. It is recommended to apply this lotion after waxing. It removes any wax particles which might remain on the skin. Blue Lotion has excellent cleansing properties due to its low alcohol content (9%) and its Rosewater fragrance gives the skin a pleasant, comfortable feeling. It is available in 250ml and 1 liter bottles. This gel is specifically designed for tired legs. It is formulated with botanical extracts to procure a sensation of freshness and well-being. The extremely fluid texture is applied in a circular motion. Non-woven strips(3x9 inches) and rolls(100yds.) offer softness and comfort while efficiently removing wax and hair. Resist tearing and shredding, may be used in any wax. Cirepil training video shows use techniques for the Cirepil waxes. Great source of tips and tricks for waxing whether you are a new or an experienced esthetician.